Help! My Lashes are Falling out! The official name for eyelash hair loss is known as milphosis (if it occurs by itself). Another term often used to describe eyelash hair loss is Madarosis which can be used to identify both eyelash and eyebrow hair loss. These terms are not necessarily important because they don't tell you why you have hair loss - but they are the official terms. 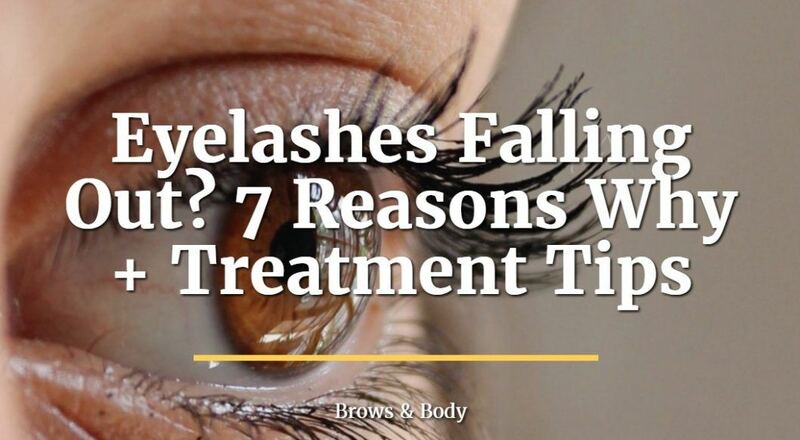 There are many reasons why your lashes may be falling out and most of them can be identified relatively easily. What you need to understand is that eyelash hair loss is usually the RESULT of some other condition that your body is currently dealing with. This problem is almost always on the inside (but not always). In addition to eyelash hair loss you can also present with eyelash breakage or simply just slow growing lashes. 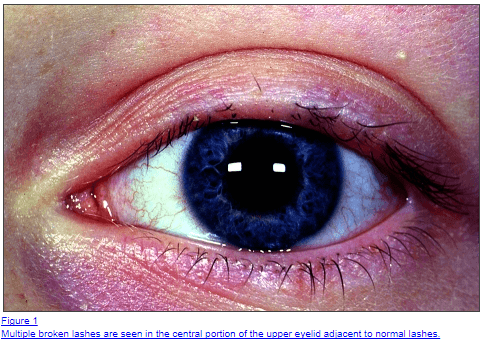 These are all conditions that fit under the same umbrella - disordered eyelash growth! Like anything there are degrees to which this can occur. Some people may experience a complete loss of their eyelashes while others may experience only 50% of lash loss. The goal with addressing your lashes is to find the underlying cause and then treat or prevent that! Many of the same issues that cause eyebrow hair loss ALSO cause eyelash hair loss. This means if you are suffering from one you may be suffering from the other. I've previously discussed several causes of eyebrow hair loss and many of the same issues that cause eyebrow hair loss ALSO cause eyelash hair loss. Generally these conditions tend to go together (but not always). If you are also suffering from eyebrow hair loss then I would recommend you read this article as well. Perhaps one of the most important causes of eyelash hair loss is a condition known as alopecia. There are different categories of alopecia but the two we will focus on today are alopecia areata and alopecia adnata. You are probably familiar with alopecia areata because it is often the cause of isolated patches of hair loss on the head. What you may not realize is that alopecia can also cause hair loss of both your eyelashes and eyebrows. Alopecia is the result of an autoimmune condition which means that your body is attacking itself and that attack results in hair loss. Doctors and scientists aren't really sure what causes alopecia at this point, but it can sometimes be treated with certain medications. Another form of alopecia is known as alopecia adnata. This is a condition that is used to describe eyelash hair loss but it most often refers to a condition in which your eyelashes are underdeveloped or simply do not grow to their maximum capacity. Those with this condition may have SOME eyelashes but they are often smaller or shorter than usual. If you have eyelash hair loss you will most likely need to see a Doctor for treatment. Another VERY common reason for eyelash hair loss is hormone imbalance. Hormone imbalance can actually refer to several conditions, all of which may impact your lashes. The most common hormone imbalances that alter eyelash growth are hyperthyroidism and hypothyroidism. Your thyroid helps to regulate the function of your skin, eyelashes, nails, metabolism and so on. Pretty much any thyroid condition can result in damaged or broken hair loss - this includes on your head and on your brows/lashes. Hyperthyroidism is a condition which results in excessive thyroid hormone production while hypothyroidism is a condition which results in insufficient thyroid hormone production. BOTH conditions may cause lash breakage. And these conditions are very common. Up to 10-20% of people in the United States may suffer from some sort of thyroid disease, so if you have lash problems there's a good chance your thyroid may be related. If you suffer from thyroid problems you will need to treat that issue to grow back your lashes/brows. Many of the conditions that cause eyelash hair loss have to do with what is happening INSIDE your body and not necessarily on the outside. This isn't true for all conditions, though. Some direct skin conditions can also cause eyelash hair loss. What do I mean by direct skin conditions? I mean anything that causes problems to the skin UNDERNEATH your eyelashes. Skin conditions like psoriasis, dermatitis, skin infections and eye conditions such as blepharitis can all cause disordered eyelash hair growth. The good news about these conditions is that they are often easier to spot. It's easier to identify a problem on your skin than it is a hormone problem in your blood. The treatment for these types of problems is usually ointments and creams which can help treat the skin problem and reduce inflammation. Trichotillomania is an impulse disease that is not quite as common as some of the other diseases mentioned here. In trichotillomania patients may inadvertently pull out or break their own hairs. These hairs may be those on their head, on their eyebrows and even their own eyelashes. This behavior is usually driven by stress or anxiety and can be treated by managing those conditions. While most people with trichotillomania may know that they have a problem it can be VERY difficult to stop the behavior - especially if the trigger cannot be identified. Trauma is a term used to describe a condition which causes damage. When you think about trauma the first thing that may come to mind is something like a cut or a bruise. 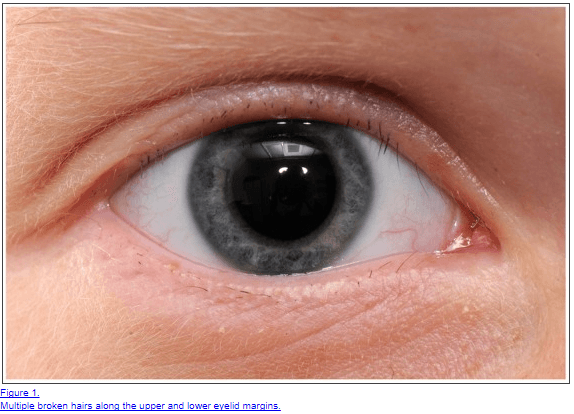 And this type of trauma can definitely cause issues with eyelash hair growth. Think about a cut or laceration to your eye area that may cause scar tissue. Once there is scar tissue covering the normal hair follicles it is unlikely that any hair will grow in that area. So pretty much any damage to the skin over your eyelashes may result in lash loss. But trauma also includes other conditions such as radiation therapy, surgery, intense hot/cold therapies and even eyelid tattooing. Any condition which damages the overlying skin may cause hair loss. But just because you have trauma doesn't mean that you will lose your hair. Many people do just fine with some minor trauma while others may experience a significant amount of hair loss from the event. Inflammation and infection can also cause lash loss. Skin infections such as topical fungal infections or viral infections such as shingles or herpes can damage hair follicles and lead to hair loss. These type of conditions usually don't go unnoticed, though! So it's good to know if your eyelash loss is due to infection because it is usually quite treatable with certain medications. Lastly certain drugs and prescription medications can lead to eyelash hair loss. Among this group of medications that can cause hair loss is the commonly prescribed SSRI escitalopram. This a medication used to treat depression and anxiety and it is very commonly prescribed! While these types of reactions are not very common they are definitely worth considering. Especially if you have a case of eyelash hair loss in which every other cause has been ruled out. If you fit into this category then you may want to start looking at your prescription drug list to determine if they may be causing some issues. Usually you can determine if a medication is causing your lash loss because the hair loss tends to start around the time that you started your medication - so there is a link. In some cases, however, the hair loss can be delayed by months. So what are you supposed to do if you are losing your lashes? The best approach to treatment is to try and identify what is causing your lashes to fall out and then treat that problem. It doesn't matter what you do or what you put on your lashes to help them grow if you are suffering from thyroid disease and you completely neglect that problem. But even if you do find the problem and then treat that issue it can still take MONTHS for your lashes to grow back. This is where you might find the opportunity to use certain growth serums that can actually help your lashes grow back. Lash growth serum can potentially help you grow back your lashes at a faster rate than usual and can even be used to help grow your lashes even if you don't have any problems. But it may be worth a try especially if you are self conscious about your lashes. Don't pick or tweeze your existing lashes! While your lashes are growing back it may be tempting to try and tweeze them, especially if some are not quite as long as others. Do your best to avoid doing this! You may stunt the growth phase of your lashes and trick your body into thinking there is more trauma to the hair follicles. Be patient and let them grow out. While your lashes are growing back it's best to avoid putting any excessive or unnecessary chemicals, dyes or fillers on your lashes. These type of low quality ingredients can limit eyelash growth and even cause damage to your skin. The best thing you can do is buy high quality make-up or use even LESS make-up during this time period. I like using organic skin care products which tend not to cause any issues on the skin. Another important way you can boost your results is by taking a high quality hair, skin and nails supplement. These supplements provide your body with the necessary building blocks to help hair growth. Ingredients like Zinc, biotin and silica can help the growth phase of your lashes. I recommend a product like this one. You will also want to avoid putting on fake lashes while your lashes are growing out. Fake lashes may cause trauma to your skin and slow down the growth process, and they also may potentially cause trauma! Even though it's tough, try to stick it out and be patient while your lashes grow back. There are many medical conditions which may result in damage or eyelash hair loss. The key is figuring out what the main issue is and focusing your efforts and treatment on that problem. Along the way, and as your lashes start to grow back, you might be able to boost the growth phase by using certain serums and by taking certain supplements. Are you suffering from lash loss? If so, what do you think is causing the problem? Have you been able to grow back your lashes?